Elephant Odyssey in the San Diego Zoo is Enormous Fun. Begin a journey through time at the awesome 7.5-acre, multi species natural habitat at the San Diego Zoo. Discover animals that roamed Southern California 12,000 years ago including mammoths and saber-toothed tigers, and get to meet their living relatives. The new exhibit also incorporates hands-on fun such as a fossil dig for kids through soft rubble, and life size replicas of prehistoric animals. The cornerstone of the habitat is the 2.5-acre Elephant Odyssey that includes a 137,000-gallon pool, gentle rolling hills, hidden drinkers and feeders to entice foraging, and the half-acre Conrad Prebys Elephant Care Center. Tembo — The Independent Thinker and the only African elephant in the herd. The newest member of the clan is Msholo, a bull elephant weighing in at 7,800 pounds. Msholo was driven 2,500 miles over 2 and a half days from Tampa's Lowry Park Zoo in Florida to San Diego under the watchful eye of the elephant keepers and a veterinarian from the Wild Animal Park. Once Msholo passes a quarantine period, a new herd will be created as he is slowly introduced to a couple of the Wild Animal Park's female elephants and their offspring. The California condor, a bird once on the brink of extinction, will also be on exhibit in Elephant Odyssey and will be visible to guests for the first time in 60 years. Other habitats include tapirs, guanacos, pronghorns, camels, horses and llamas. 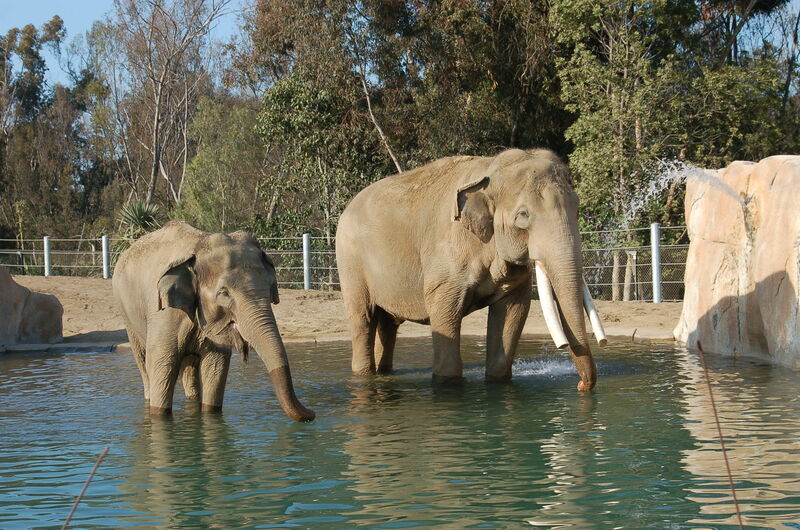 The San Diego Zoo is located at 2920 Zoo Drive in Balboa Park, just north of downtown San Diego (619) 231-1515. Elephant Odyssey events and packages are available at Elephant Odyssey Safari Sleepover, Hard Rock Hotel San Diego, and Courtyard by Marriott Mission Valley. For more information visit San Diego Zoo online. A jumbo conservation effort is being coordinated by the San Diego Zoo and Elephants Without Borders in Botswana. Founded by biologist Dr. Michael Chase, the organization is passionate about boosting wildlife conservation in Africa, and studying Africa’s largest remaining elephant population, Three radio-collared elephants, each belonging to a different herd, are peddling their footprints at $150 to help raise funds for this conservation project.